Cold and flu season is officially here in full force! Did you know that school age kids get around 8-12 colds per year? It’s time to pull out all of the stops to protect your family from getting sick. I always cringe thinking about cold and flu season; going to the playground, it’s almost like I can see germs being transmitted through runny noses, sneezes, and coughing fits. When we send our kids off to school they spend all day surrounded by other kids that can easily pass on germs and sickness. Protect your family from cold and flu season this year by following these easy flu prevention tips. Wash Your Hands: I know, washing your hands seems like a given. But are you washing your hands correctly? Washing your hands is one of the easiest and most beneficial ways to prevent the flu. First, it’s important to wet your hands with warm water. Apply soap and lather well. Make sure to rub your hands vigorously together for at least 20 seconds; wash in between your fingers, under your finger nails, the palms of your hands, wrists, etc. Rinse well and dry your hands with a clean towel or paper towel. Use the towel to turn off the faucet. It’s also extremely important to teach our children the correct method to wash their hands. Have them sing the ABC song while scrubbing their hands. 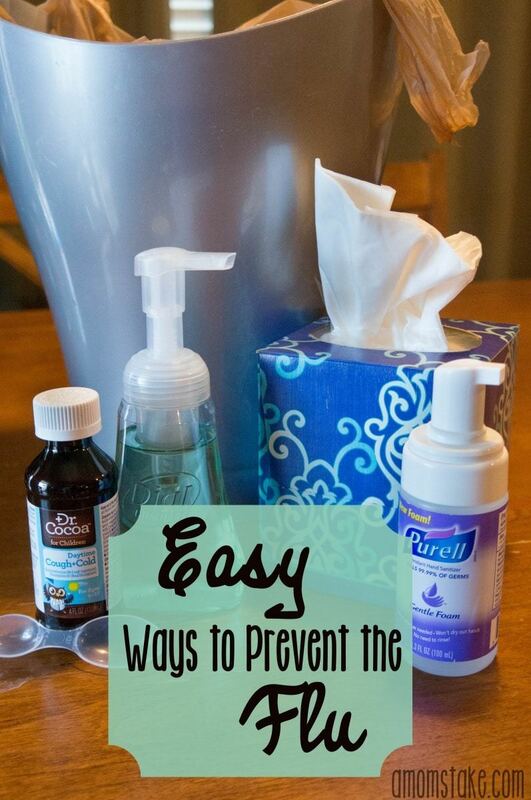 Flu Prevention Station: Create an area in your home where your family can blow their noses, properly dispose of their tissues, and sanitize their hands. For me, my flu prevention station is in the front room. This area of my home includes tissues, hand sanitizer, and a garbage can. Making these items easily accessible to the whole family helps protect everyone from spreading germs. Eat Plenty of Fruits and Veggies: Consuming foods high in vitamin C, vitamin D, and B vitamins will help boost your immune system. Try including some of these foods into your diet: broccoli, oranges, cauliflower, and cantaloupe. For younger children who may be picky eaters, try creating green smoothies with fruits high in Vitamin C.
Sleep: Help your body fight off illness by making sure you’re properly rested. Try to get at least 8 hours of sleep. If you know you’re going to have to get up early, make sure to head to bed early and allow yourself plenty of time to unwind. To help you fall asleep faster, unplug all electronics 30 minutes before heading to bed. Meditate, take a warm bath, or perform relaxation exercises to prepare your body for a soothing night sleep. For younger children, make sure to try and keep their bedtime/nap time schedule consistent. Make sure they have plenty of rest each day. Keep your hands to yourself: It’s important to teach kids (especially during cold and flu season) to keep their hands to themselves. This includes making sure your kids are careful not to touch their eyes or put their hands in their mouths; eliminate ways that germs are introduced into the body. Teach your children to cough into their sleeves and wash their hands frequently when interacting with other children. Despite valiant flu prevention efforts, sometimes sickness is inevitable. Our family has already had a case of coughs and sniffles through our home from my oldest bringing home a bug he caught at school. 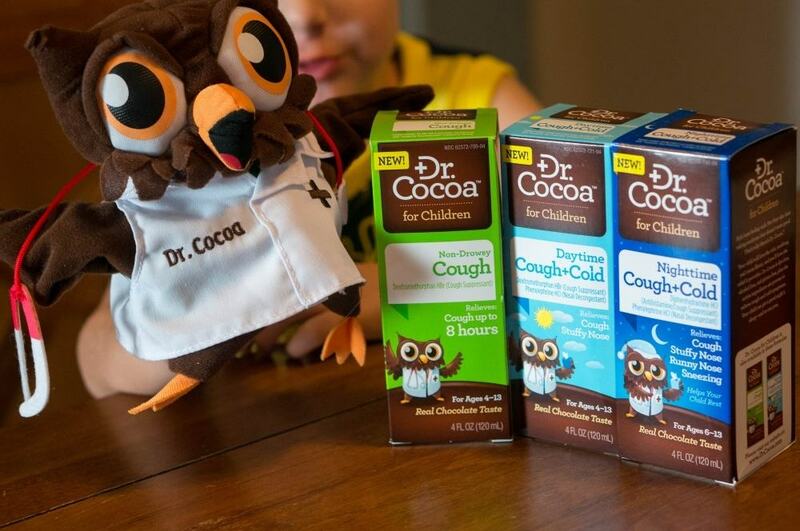 Dr. Cocoa™ is a new cold/flu medication that is made with 10% real cocoa for a great chocolately taste! When my son needed medicine for his cough, I knew just what to try! He usually complains and fights having to take medicine when he gets sick, but he had no issue with his two scoop dosage for his age. When he finished the first scoop, he immediately said “Mmm, Chocolately!” The taste definitely made it so much easier to give him the medicine he needed to keep his coughs under control. You can try Dr. Cocoa yourself first hand with a printable $2 off coupon on their website! Dr. Cocoa products are FDA regulated medicines and should be used only as directed and kept safely out of reach of children. I’ve never heard of Dr Cocoa or tried it before. It looks really cute. I’m always trying to prevent our family from getting sick and I try to have the best meds available for when we do. I like that my son’s first grade teacher encourages them washing their hands a lot. He still got sick though, lol. He’s down and out w/a cold this weekend (better than the flu). I’d try the Dr. Cocoa, and thank you for the coupon to do so! Great tips! I seem to always get sick during the transition from Summer to Fall, so I will keep all this in mind… Especially for the kiddos! These are all great tips! We follow kind of the same plan for staying flu-free. Thank you so much for these great tips. Anything I can do to prevent the flu, I will do. These are all great tips. I know when my son was in school he was sick ever other month at least. Once we started homeschooling in the 3rd grade he would get sick only once or twice a year. Never heard of Dr.Cocoa its such a cute owl! Thank you for not suggesting the Flu Shot I dont believe in that so thanks for all the other cool options!